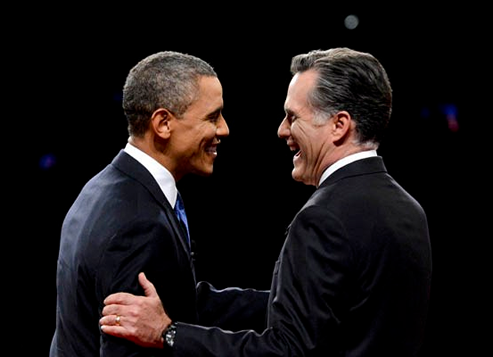 What do Barack Obama & Mitt Romney pay in taxes? 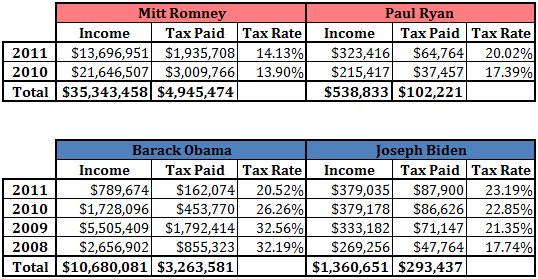 The 2012 presidential elections are just weeks away, so I wanted to know how do I stack up against the President and the Republican nominee Mitt Romney (and their running partners) when it comes to taxes. Political issues aside, I’m curious how an average citizen, the role I will assume today, compares to the most influential and powerful people in the country. Just note that all the above returns were filed “Married, filing jointly”. Almost 5 million in taxes paid in the last two year. 7 million made in charitable donations over the same period of time. Reported no income from wages, salaries, and tips for 2010 and 2011; received income form capital gains, dividends, and various fees collected. His 2011 tax return has 379 pages and includes 24 forms and 10 schedules. By looking at the above tax returns data, there is one that is the most “entertaining” to review. The clear winner is this category is Mitt Romney. The presidential salary in 2011 was $394,821; in 2010 that salary was $395,188 which means the president took a pay cut of $367.00. The remaining portion of the president’s income came in form of a business profit – he is a published author and the biggest chunk of his income came from 4 books he wrote in the last 7 years. The President and the Vice President provide much more insight into their financials (12 years of returns) than the Republican nominee Mitt Romney and Paul Ryan (2 years). So who’s to gain / lose from becoming the next president? 2011 tax rates ranged from 10% to 35% and arguably all four individuals fell into relatively low bracket. Based on the information publicly available, I think that Mitt Romney has the most to lose, in economic terms, if he is elected the next president. The presidential salary would be a minuscule increase to his current income and would potentially prevent him from serving the executive functions and diminish his sources of income from those activities. Naturally, nobody seeks to become the president for the money and a chance to become a very influential figure in American history is priceless. The numbers show that the job as a president is not the most lucrative one. The President Obama, if re-elected, is facing another four years of sub-$400,000 salary and as time has shown, he can expect less time being devoted to writing. That portion of his income was well over 50% of what his family earned in the recent past, so the job as the president has plethora of “perks”, none of which if financial. The most obvious observation based on the above tables is that I pay more in taxes that Mitt Romney and my income doesn’t fall anywhere near what Mr. Romney makes. On the flip side I have to admit that it’s honorable that he shares significant portion of his wealth in form of donations. The final conclusion is that tax law is very tortuous and having a good accountant is very important. It requires knowledge and skill to maneuver through the rules and regulations and put together 379 pages of information. Diversifying one’s activities and educating yourself on pros and cons on each of them (from tax stand point) can deliver almost improbable results. Tax deadline is only 6 months away. It’s time to get prepared.